Learning Polish, as with any language, is arguably challenging. Different sounds. Different grammar. But, it’s super rewarding if you do end up learning it. You become one of the rare, few non-native Polish speakers which makes you extremely special to the natives. Polish is not an obvious or “go-to” language to learn. Most people try Spanish or French. So, that’s exactly what makes you unique and different. Plus, people are always happy when someone’s trying to learn their tongue, right? They’ll be even more shocked when you can speak and understand them. So, let’s learn this language. In this “Learn Polish” guide, I will show you how to learn Polish and give you a road-map to follow. That way, you will know where to start now, where to go next, and how to succeed. Here’s what you will cover in this guide. Feel free to click on any of these parts to jump into the section. Why should I learn Polish? What makes the Polish language unique? Polish Culture – What Should I Know About it? How difficult is it to learn Polish? The Polish Writing System – How to Master It Fast? I’m a Beginner – What Mistakes Should I Avoid? What is The Best Way To Learn Polish? Polish is a Slavic language that started around the 10th century. And yes, Slavic like Russian, Ukranian, Czech, Slovak – same family – but that doesn’t mean it’s the same. It’s a west Slavic language to be exact. How many speakers? About 55 million worldwide, of course mostly in Poland. It’s also the second most spoken Slavic language, after Russian. What’s it sound like? Take a listen to a lesson from PolishPod101.com (click here to visit), a Polish learning course/site that I use. If you’re like most Polish learners, you want to know where you can go and learn right now. The fact is, Polish is not a popular language to learn so there are not many high-quality resources. That’s just the nature of supply and demand. What do I suggest? A) Definitely Textbooks. 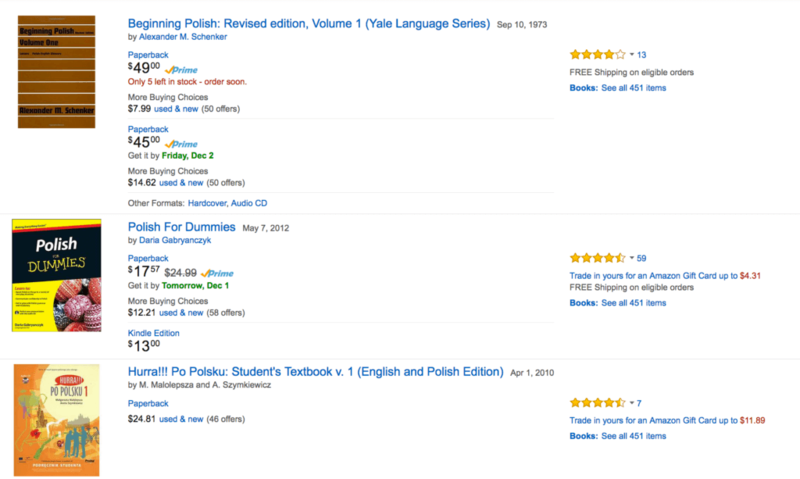 Visit Amazon.com (click here) for Polish textbooks – and choose whichever has the best rating/price for you. Don’t think too much. Any start is good enough. Polish textbooks are a safe way to start learning. B) PolishPod101. 600+ of Audio & Video Lessons by Polish Teachers. PolishPod101 is an online course for self learners. Mostly Audio & Video courses. You get new lessons every week so they’re always growing and improving. You go from beginner to advanced and learn to read, speak and understand Polish. Very beginner friendly and highly recommended. You can use their app too. Click here to visit PolishPod101 & start learning right now. Be sure to check out their “Top 10 Ways to Start Learning Polish” lesson below. You should probably learn the greetings first. Any beginner should start with the “hi” “bye” and “how are you” basics, right? But if you’re itching to learn and speak more than my little blog can teach… skip down to the resources below. The Polish language can be challenging for learners. Especially if you are from from Western Europe, Latin America, the United States and other distant countries. It is easier to learn Polish if you are from a Slavic country. People from places like Russia, the Czech Republic, Slovakia or Ukraine do not have any problems with learning Polish. That being said, you should learn Polish and here is why. A. You will be special. Seriously. As of 2010, there are over 55 million Polish speakers worldwide. Polish is also one of the official languages of the European Union. In the US, there are over 11 million Polish Americans but not all of them are fluent. So, the point is, you’ll be among friends when you learn Polish. More importantly, like I said before, as a non-native Polish speaker, you will be rare. So, the friends that you make will not only be impressed but hold you very dearly in their hearts.
. What does that even mean? What are these magic “business opportunities” I speak of? Simply put, you will be able to make money with your Polish skill. By knowing the language, your opportunities increase, whether you believe it or not. Maybe you can impress a Polish business person who decides to hire you because you’re clearly talented and hardworking enough to learn his language. Or a company will hire you because they need an English speaker and you stood out for learning Polish. Or, you’ll have the opportunity to teach English to Polish people. Who knows, you can get on TV as a personality. You can be a Polish to English translator. Or, you can start a blog or video series and put your Polish knowledge to use. All of these things are realistic and doable, to various degrees, if you know the language. It all depends on what you do with the language. C. It’s an exotic and challenging language. Recently, there has been an increasing interest in learning Polish. Many learners see Polish as a very exotic and “difficult to learn-language.” And that motivates them to learn. It’s a similar reason why people take on learning unusual languages like Indonesian and Swahili.
. Another reason why people learn Polish is the desire to learn the language of their ancestors. There are over 11 million Polish Americans in the United States who are not fluent in Polish. Of those 11 million that do learn, they’re doing it to get in touch with their roots. 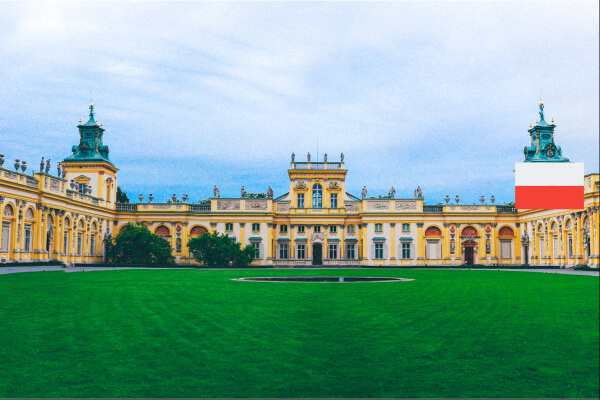 Learning Polish is an opportunity to learn about rich Polish culture and history. E. If you go to Poland, you need to know the basics of the language! Polish people are not fluent in English. So, if you want to make your stay in Poland enjoyable, learn Polish. It will help you avoid simple language problems and allow to make friends, order food, and even find where the nearest bathroom is. Many foreigners that come to live in Poland take language classes. Why? They simply want to feel comfortable in a foreign language environment. Despite the initial struggles in learning the Polish language, many learners are successful and after some time are more and more fluent in Polish. F. For Love. Yes, love is a very strong reason to learn Polish. One of the rare Polish learners that you’ll come across are doing it for their significant other. In the recent years, there has been an increase in British-Polish marriages and more British men interested in mastering the language for their wives. The Polish language has many unique features. Before the Second World War, there was a whole range of Polish dialects. People could easily identify where you were from based on your dialect. After the Second World War, the Polish population was shuffled, and as a result, the dialects were largely annihilated. Currently, there are differences in pronunciation especially in three regional areas: Poznań, Warsaw, and Kraków, but they are negligible if compared with dialects in other countries, such as Denmark or the Netherlands. Some areas also have words and expressions that are specific to a given region (Silesian, Podkarpacki) but their number is so limited that they are not noticed in an ordinary conversation. For instance, the Silesian Polish language is spoken in the area of Katowice. It is a dialect with an audible influence of Czech and German vocabulary and has strange pronunciation. Most Poles think that Silesians have a pretty funny dialect. Podkarpacki/góralski dialect: A number of smaller societies living in the Polish mountains put special emphasis on old traditions and clothing. They also speak a special dialect, the Podkarpacki/góralski dialect, where some of the vocabulary is completely different from Polish. Even Poles do not understand their dialect. This social group is not that large, and the culture of the Mountaineers (clothing, songs, poetry, craft, etc.) is used today only as a tourist attraction. Also in America, you can find Polish-speaking communities whose language sounds like a Polish-English mix. The largest of these communities is located in Chicago, where it is estimated that 250,000 people speak Polish on a daily basis. Don’t worry about Polish words too much because there are many international words, or words taken from English, in Polish. Their meanings are easy to guess. Most Polish, however, words come from Latin, and a lot of them are borrowed from the languages of neighboring countries. On top of this vocabulary, the Poles also speak fast. So you need to get Polish listening practice to understand the content of the conversation. As mentioned before, I recommend PolishPod101 which has a lot of audio lessons to train your ear. As with most European languages, Polish nouns are masculine, feminine or neuter. This is not just a grammatical division. Poles also determine the gender of all subjects and names of professions. Most of the job titles indicate unambiguously male or female gender; hence some members of the feminist movement are struggling to introduce female forms for the names of managerial positions, such as a director, a minister or a chairman. Many women, however, choose male forms. Adjectives and prepositions are also inflected by gender. Male words end with a consonant (syn – a son, computer – a computer, telefon – a telephone). Words with the female gender with a vowel “a” ( kobieta – a woman, ulica – a street). Finally, gender-less words end with “o”, “e”, “ę” or “um” (auto – a car, morze – a sea, cielę – a calf). The Polish language does not sound like other European languages. Polish pronunciation is challenging, but this is not just a matter of a strange accent; words and their variations have a certain coherence, which also involves sounds. Remember, you can’t speak any language without mastering the sounds. So, if someone from Western Europe or another part of the world wants to learn Polish, it is a good idea to start learning the sound system. It is the key to grammar and consequently to mastering the language. Check out this free lesson to get started. Press the play button below. Check out PolishPod101 for more easy lessons, video courses and notes to read along with. Generally, both Polish vowels and consonants are pronounced a little strange, but it’s not that hard to remember. “Ą” and “ę” – these are nasal vowels that are pronounced like “ou/oun” and “eu/eun.” In some contexts, however, they lose their nasal character and then they are pronounced as usual “a” or “e” in Polish. This is especially true for “ę” when it is the last letter in the word. “sz”, “ż”, “cz”, “dż” – all four sounds are pronounced, holding the tip of the tongue up. The pronunciation of “sz” and “ż” creates friction, with the pronunciation of “cz” and “j.” The sounds of “sz” and “cz” are voiceless, and “ż” and “dż” are voiced. When the sound is voiced, vibrations arise in the organs of speech, but if the learner does not feel sure about the voicing, it is best to practice the pronunciation with a professional pedagogue. si, zi, ci, dz – are pretty simple to pronounce. “Si” and “zi” are long sounds, “ci” and “dz” – short ones. “Zi” and “dz” are voiced, “si” and “ci” – voiceless. s, z, c, dz – the tip of the tongue is pointing down. The pronunciation of “s” and “z” creates friction, with the pronunciation of “c” and “dz” as a result. The sounds “s” and “c” are unvoiced, while “z” and “dz” – voiced. The Polish alphabet seems scary at first, but as you can see, it’s not that bad. Just memorize some important Digraphs and Trigraphs, review the Polish “native” letters and that’s it. When you see a word consisting of more than one syllable, put stress the next-to-last syllable. In the English language, it’s mostly done to people’s names. In Polish, it’s done to all kinds of nouns. Poles love diminutive forms and derivative forms that give a word or a name a special meaning. Diminutive forms are created by adjusting the endings. The overwhelming majority of Polish names have one diminutive form (often several). Diminutive names are used by family members, friends, and colleagues. Lovers also prefer diminutive forms. Do you know what the most popular Polish swear word is? It’s “kurwa”, which literally means “prostitute.” But, as a typical cuss word it is used to intensify the speech. It’s kind of like the “F” word! In some social circles, this word is used very often, but most people consider it vulgar. People who consider themselves cultured often say “kurcze” or “kurde” instead of “kurwa” – these words are softer (like English “what the heck”). Polish swear words refer mainly to sexuality and genital organs, and some of them are borrowed from English and Russian. Among them, English “f” word is in the first place. The Polish language has two ways of addressing others. The word “you” can be used with a family member or a friend. Young people usually say “you” among themselves, even if they do not know each other. So, these are just a few of the things that make the Polish language special. Now, what about Polish culture? All countries have certain values and characteristics that are worth remembering. While you learn Polish, be sure to learn the culture. The Poles will definitely appreciate that you take the time to learn about them. I mean, wouldn’t you be happy if someone wanted to learn more about you? During the Second World War, Poland was divided between two countries with totalitarian ideologies: The Third Reich and the Soviet Union. Totalitarian systems were based on fear and violence. Years of captivity clearly reflected on Polish culture, when a huge number of museums, schools, cinemas and library collections were destroyed. We must not forget about the destruction of Polish intelligentsia. Polish people remember, however, totalitarianism through actions such as exterminations, concentration camps, and gulags. Unfortunately, these are terrible pages of history that have happened to the Polish people. Today, a lot of tourists from all over the world come to see the terrible places, such as the Gestapo concentration camp, in order to see these places and to understand the reasons for the formation of Polish culture. This history affects almost all aspects of Polish culture. You will learn more below. For Poles, tradition and religion are important. Poles, dealing with oppression and foreign forces for over several decades, transformed their traditions into a tool for maintaining their national consciousness. All kinds of rituals and customs are connected in some way to the Christian religion, which has been the main religion in Poland for over a thousand years. The village population is the most attached to traditions. This is because it is the least vulnerable to modernity. All changes take place in the village much slower. Poles believe in God, and faith certainly helped them in difficult times. The history of the country plays a fundamental role in shaping its society. In times of danger or loss of state sovereignty, poets take up the struggle for freedom and for saving national values. So, Polish literature is characterized by patriotism, a fight for freedom at all costs. Polish literature deals with current life issues, and the authors receive a new role of calling for the fight and mobilization of the entire nation. The subject of freedom is visible in many Polish books and is often put up as the ultimate goal of life. The Motherland is understood not only as a civic service but also as an emotional part of the life. In difficult times, writers and poets became the supporters of the population. In addition to writers, nowadays, filmmakers and musicians also help to develop Polish cultural awareness. Modern Polish music does not differ much from the world music. It is worth mentioning only that there are typical Polish genres of music, for example, disco-polo – cheerful dance music for young people. K. Kieślowski is one of the most outstanding Polish film directors; his films have become important for European culture, he was able to fascinate even an American audience. He “spoke” in a language understandable to people from different corners of the world. Polish films are shown at prestigious festivals, reach global cinema distribution and gain many supporters. An excellent example is the movie Pianist (2002), which is a very important film for the Polish people. It is worthwhile to watch it so you can understand the whole essence of the above text. Poland has a rich culture. Unfortunately, not everyone knows this. Many just go by the stereotypes about Poland. With the word “Poland” they associate a less developed, backward country, thievery, and drunkenness. Polish want more people to know the inside of their nation, that’s why the Polish government invests incredible amounts of money in the development of tourism. As you learned earlier, it is easier for learners of Eastern European origin (Czech, Slovak, Ukrainian, etc.) to learn Polish. For the rest of the world, it’s more challenging. So, the answer is yes, it’s difficult. But, don’t let that scare you. Here’s why. Korean, Chinese and Japanese are rated as category 4 languages by the Defense Language Institute (of the United States). Ooh, Category 4, sounds scary, right? Well, guess what. Polish is Category 3. The higher the category, the harder it for English speakers and farther it is from English. BUT… MILLIONS are learning Korean, Chinese and Japanese right now. They are succeeding simply because they stick with it and believe they can succeed. So, if you believe you can learn Polish and have the desire, you will. Now, let’s get into the details of learning Polish. First, you need to decide what your purpose is. 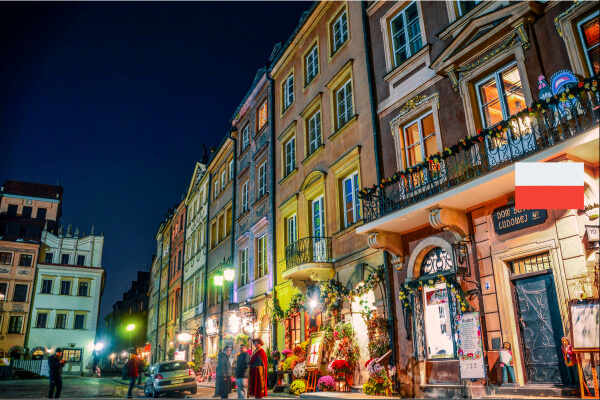 If you want learn Polish to shop on your trip, then you only need to learn a few dozens of words and some phrases. Then you do not have to worry. If you want to read Polish or get acquainted with the general meaning of written texts, you can also achieve that without much effort. In this case, you have to learn around 1000 to 2000 words and not worry about grammar. Difficulties only appear when you go and try to have fluent conversations. This can’t be achieved without a knowledge of phonetics or the “sounds” of Polish. As a note, you can learn Polish vocabulary and Polish grammar much more easily than the pronunciation. So is it hard to learn Polish? It depends on how quickly you are able to learn the sounds and the phonetics. The faster you do that, the faster your progress will be. I recommend exercises in pronunciation with a specialist, preferably even before someone starts learning Polish, it can also be done with the right language lessons. Alternatively, you can buy a textbook and ask your partner or friend for help in learning the language. You can try this way, but it is difficult to learn Polish pronunciation with a book, and it rarely brings positive effects. If, however, you first devote a few months to mastering the sounds, you can learn a lot on your own and with the help of friends. What exactly makes it difficult to learn Polish? But, it’s difficult enough that even native Polish have trouble with their own language. a variety of personal pronouns. These rules are true “black magic” for most foreigners. Theoretically, it is easier to learn Polish to other Slavs, because Slavic languages are similar in many respects. But in this similarity, there is also a trap. Russians, Ukrainians or Croats will learn the basics sooner, but they will tend to transfer certain rules from their language to Polish, and as a result, they will make mistakes. So if you are from Ukraine, Russia, Kazakhstan, Croatia, Belarus or another Slavic country make sure you pay attention to the grammar in order to avoid the mistakes. Foreigners often describe Polish as the “rustling” language. This is due to phonemes such as “sz”, “cz” or “ś”, “ž.” It is not easy to read them, and even harder to pronounce. There are some situations when you read a text, and some sentence is filled with such rustling phonemes. For Asians, the pronunciation of Polish words is really difficult due to the different construction of the larynx. But undoubtedly, it’s possible to learn Polish. As an example, you can see a huge number of foreigners in Poland and around the world who have succeeded in Polish language learning and have not spent dozens of years studying. If you want THE FULL guide, here’s a PDF Alphabet lesson below. Download it, print it and save it for your personal study. Click on the image to download it. Now, let’s talk about the Polish Alphabet. It’s not complex, dear reader. There are 32 letters – 9 vowels and 23 consonants. Yes, there are some unique Polish letters that you won’t know. Which ones? The ones with diacritics, or little squiggly lines or dots above the letter. Take a look below. ą – ch – cz – ć – dz – dź – dż – ę – ł – ń – ó – rz – sz – ś – ż – ź. 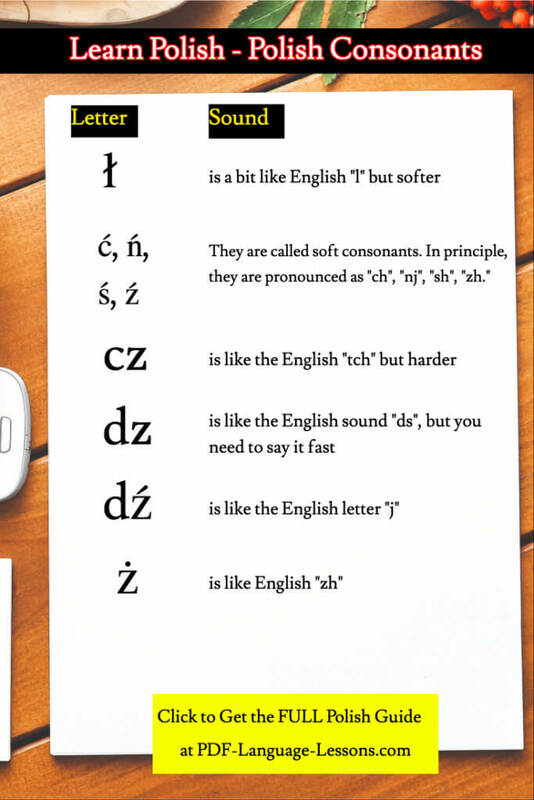 Apart from that, the Polish alphabet is made up of Latin letters. The same letters that you are reading right now. Note that the letters “q”, “v” and “x” appear only in international words. Another thing you should know about the Alphabet is is, the historical development Polish has caused some characters to have the same sounds. In other words, someone screwed up along the way. This may confuse you but don’t worry. Polish people get confused too. One of the most typical mistakes that a Pole may commit is incorrectly writing the letter “ó” instead of “u” (or vice versa). These two letters are pronounced exactly the same (sound “u”), but in the eyes of many language purists, the incorrect spelling of one of these letters instead of the other makes it possible to assess the writer as an uneducated person. It should be taken into account that a lot of time in schools is devoted to practicing the using of these two letters and a pair of letters rz/ż, which have the same problem – they sound the same, but they are written in different ways. After mastering the Polish alphabet and the sounds, you will discover that the pronunciation is surprisingly close to the spelling. It is usually possible to pronounce a word based on its sound, and you can write a word correctly without any problems, even if you hear it for the first time. But of course, this requires learning both the sound system and the alphabet. Try to memorize these specific Polish letters in order to speed up your learning. Foreigners who learn Polish usually have this one same problem. They learn Polish usually with teachers, who speak very clearly to them. Sometimes, too clearly. Too accurate speech is a disadvantage for learners. Students accustomed to listening to their very clearly speaking teacher often can’t understand an average Polish speaker. They, in turn, are completely misunderstood by Poles, because this super clear-speaking teacher did not pay attention to their pronunciation and did not spend the time on the correct pronunciation. Learning the correct pronunciation is very important, and at the same time is often neglected by self-learners. This applies also to those learning Polish as their native language. What about classes? You won’t spend much time on pronunciation in Polish language classes either. At best, you’ll have 1-2 initial lessons covering spelling, pronunciation and the Polish alphabet. Definitely not enough time to master and learn Polish pronunciation. So, don’t make the mistake of learning at a class that does not emphasize pronunciation. A teacher’s knowledge is can make or break you, the learner. In order to be able to teach Polish, the teacher must know the rules of correct pronunciation and the principles of phonetics. So, this mistake kind of goes in line with the second one. Get someone that knows how to teach pronunciation. It’s a mistake to learn from text first. Unfortunately, that’s how most learners begin. Then, they develop improper pronunciation when reading Polish texts and trying to sound things out. You should learn by ear first. 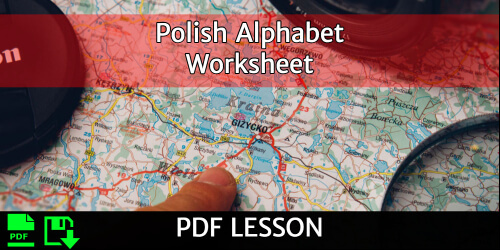 Learn all the sounds and all letters in the Polish alphabet, the pronunciation of all sounds, diphthongs, and letters and only then practice. 1. Learn the alphabet. I will repeat, in the Polish alphabet, there are some unique Polish letters, but apart from that, you’re dealing the letters of the Latin alphabet, the same letters you’re reading now. 2. Master the sound of the language. It is a good idea to start learning Polish by listening to how it sounds. Not only is it good for your listening, speaking and accent, but it is also the key to grammar and consequently to mastering the language. You should know how to pronounce all sounds, diphthongs, and letters.
. You should know that the Polish language isn’t the most popular language to learn. However, this is slowly changing. In order to train your ear and learn Polish pronunciation, you should start with “listening.” For that, I suggest audio and video lessons that expose you to Polish conversations. The best textbooks currently available are the Hurra series of books (series 1, 2, and 3) by Prolog publishing. Prolog also published the Polish grammar book in English and German and a Start 1 textbook in English, so it’s a great book for foreigners. “Słownik Minimum Języka Polskiego” or “The Minimum Polish Language Dictionary” which is great for beginners. It contains the most used words in Polish. 4. Choose the right teacher. If you decide to take private lessons, it is best to find a Polish native speaker with a graduate education in the field of Polish philology, preferably also with a specialization in teaching Polish as a foreign language. Ah, you came this far. Here’s what you need to know as a Beginner. Don’t aim for fluency, perfection or wish for success. In my learning experience… and especially watching others, this is what trips many people up. They dream of mastering a language. They’re disappointed when they don’t learn as fast as they’d hope. They worry about “why” and “how” and let their emotions run wild. They quit. And… quitting is failure. Done. Learn & write the Polish Alphabet in 2 Weeks – Deadline: November 21st, 2016. Finish 25 Beginner Lessons on PolishPod101 in 1 Week – Deadline: January 9th, 2017. 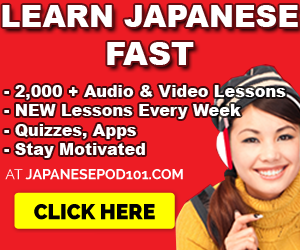 Learn 10 words in 1 week – Deadline: December 25th, 2016. Don’t quit; continue. Don’t worry about your progress, success or failure. Not important. Just finish learning for today. And then continue tomorrow. You know what’s great? Small goals are easy to achieve. Once you learn, say 10 words, you’ll move on to the next goal – and you’ll learn 20, then 30. Then you realize… “hey, I’ve been sticking with it for a good 3 weeks! Hey… I can hold a conversation in Polish. And I can read! Now, you are ready to learn Polish. Just follow the tips inside this guide and you will be fine. P.S. If you honestly want to learn Polish, I recommend PolishPod101. You get 600+ audio/video lessons by Polish teachers, tons of study tools, apps and vocabulary lists. This is a friendly online learning course. Sign up for free at PolishPod101 (click here). This entry was posted in Polish and tagged learn Polish, Polish by admin. Bookmark the permalink.